Brining may be the most important thing you can do to any piece of meat you prepare, regardless of how you cook it. It is vitally important if you have chosen a cooking method that uses dry heat, such as grilling or smoking. When it comes to your backyard cooking, you need to start with a brine. A brine is a salt water mixture. When you place meat in a brine that has more salt than meat, liquid will flow through the cell walls into the meat, which adds moisture. You can check this by weighing a chicken breast and then placing it in a salt water brine for a few hours, remove and weigh again. That chicken breast is now heavier. The added weight is inside the meat in the form of water. In addition to adding moisture, salt breaks down proteins and therefore tenderizes the meat. A general brine is 1 cup of table salt to 1 gallon of water. Kosher and coarse salts, which dissolves easier, are lighter in weight by volume so you would want to use about 1 1/2 cups of Kosher salt per gallon. This is based on standard salt without iodine. You know that your brine is right if it will float a raw egg. Another way to measure this is to use 1 tablespoon of salt per cup of water. 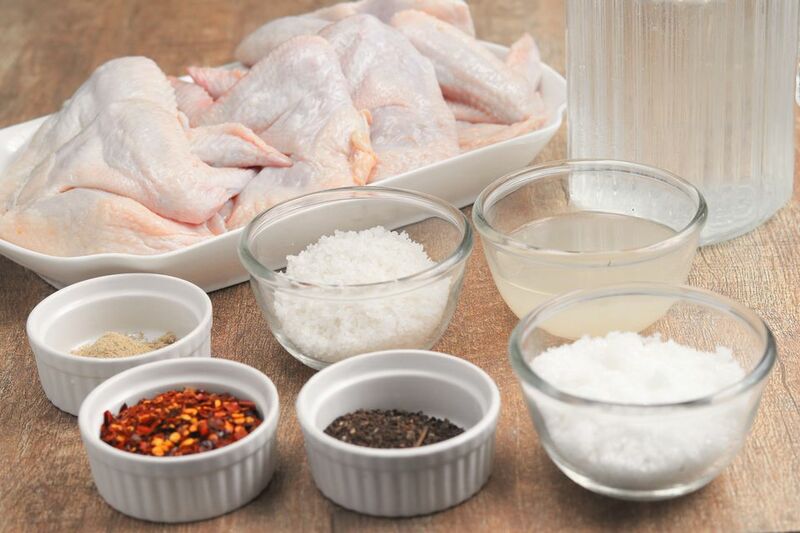 Take the poultry you intend to brine and place it in an appropriately sized container. Add enough water to completely cover the poultry, plus three more inches. Measure the water to determine the amount of salt needed. Place that salt in a bowl and pour in enough boiling water (pre-measured) to dissolve the salt. Pour this into your container and add the remaining water (ice cold) and then the poultry. Now you are brining. When the poultry is ready to come out of the brine, remove it, rinse and drain. It is now ready to cook. The brine must be discarded and everything washed thoroughly. Brining too long can be a bad thing (too much salt, etc.). So, it is best to err on the side of too little than too much. In general, poultry brines for an hour per pound, but the thickness (or mass) of the poultry is more important than the weight. A whole chicken should be brined somewhere between 6 and 10 hours, but a whole chicken cut up, should be brined no more than 4 hours. A Cornish game hen will be ready to cook in about an hour or two, while a whole, large turkey will need at least 24 hours. Like all cooking, brining is something you should experiment with and adjust to your own tastes, and speaking of which, throw in some herbs, spices, and vegetables to give your brine flavor.